I heard this story of violence near Cusco, Peru this weekend and I have struggled as to whether I should share it or not. I worry that stories of scams, petty robberies, and violence will be the nail in the coffin to those who are already nervous about travelling. That perhaps people will decide not to travel instead of understanding that crime against travellers is most often traveller to traveller crime and that it is very easy to stay safe on the road. But this is a difficult story to ignore and reminds me of the only time in my entire travels that I was truly fearful for my safety. 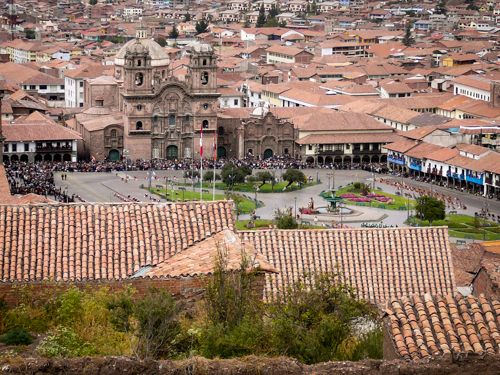 There was to be a transit strike in Cusco on the day our bus to the Inca Trail was scheduled to leave so the trekking company decided to bus us out of town late the night before to avoid it. Leaving the lights of Cusco behind us, we entered the inky blackness of the altiplano. Peering out the window I could suddenly make out shadowy figures along the side of the roadway. Thinking them to be protestors making their way to the city for the next days activities, we didn’t think anything of it; until a hail of rocks began pummelling the windows of our bus. Hunching down, I raised my head just enough to peek out the window. Large rocks, shrubs, and tires littered the roadway; various men roamed the sidelines chanting and yelling as they hurled more rocks our way. I crouched lower, shaking uncontrollably as I willed away the stories I had been reading about the Shining Path and their methods of gaining attention and control. I made myself keep my eyes open to avoid visions of the bus being stopped and boarded by such obviously upset, and violent, men. I could only hope that the bus would continue on and that it would soon be over. Our convoy of buses did not stop. I don’t think they would have stopped for anything. They muscled through and soon we were past the danger, although no one on that bus relaxed until we reached our final destination. The story coming out of Peru this week is much more serious; the people involved lucky to have escaped with minimal physical injuries although I can’t imagine the emotional turmoil they must be facing. I share their story, Nightmare In Peru, not to sensationalize the events, or to scare travellers away from Peru or from travelling, but to be responsible. I don’t want to only report the good side of travel and ignore that things can, and do, go wrong. To be clear; there have been plenty of travellers who have passed through this way in cars and campers, on bikes and motorbikes, without any trouble what-so-ever. Those who have reported Peruvians to be friendly, kind, and generous. These three were obviously terribly unlucky but we cannot ignore that it happened. I believe that we will never understand the motivation behind such an act but as I read more about Peru, and of the Shining Path era, after my own incident I did gain some perspective around the history and culture of Peru. I think it’s part of travelling; not just seeing the sights and enjoying the food, but also learning about a place, about the history of a place, about what makes it tick and sculpts it into the place that we visit. I encourage you to not only read the stories from this past few weeks but to also look deeper and research a little more about the area. It won’t change what has happened or what may happen in the future but a little understanding cannot be a bad thing. ← Should We Have Skipped The JR Rail Pass? Hi Gillian, I fully agree with your thinking, it’s our full responsibility to understand the places we go to and not just consider turning up at a place and watching it like a TV-show around some highlights. These latest events still leave me in disbelief, I can’t say that I’m fully surprised, but still. I read this story yesterday. So scary. I can only imagine the terror that they felt, regardless if the incident was isolated. We visited Peru and had no troubles at all, in fact we drove down that very road. It gives me shivers thinking about it. Wow I’ve been to Peru and can’t even imagine that happening there. Although I have since learned that our guide on the small 6 lady tour I was on, is apparently a scam artist. It’s been a bit disillusioning. We also had some eye opening experiences dealing with a tailor in Thailand and a tuktuk driver. They’re all smiles and bows but we learned that they’ll kill you if you cross them.